If you are over the age of 55 and have smoked one or more packs of cigarettes a day, you should consider the Lung Cancer Early Detection Program. Over 300 patients are already enrolled and several have had their lung cancer diagnosed & cured. The care of a patient does not end when the office visit is over. The care of a patient does not end following a hospital discharge. The care of patients with chronic disease states such as COPD, heart disease or diabetes has been made more difficult by the fragmentation of medical care. Patients are seen by one physician in the office and another physician in the hospital. They are seen by specialists caring for one organ system or the other. How can we manage the care of patients with chronic disease states and keep track of problems before they arise? Patients with COPD are told that their disease cannot be cured. They are told that their disease is Dr. Zlupko consults with a Chronic Management patient progressive and to tell their lung doctor if they are having more problems. It is not feasible to see a patient with chronic lung disease with the frequency that could keep them from developing problems which often results in hospitalizations. The three basic goals for the treatment of patients with chronic lung disease such as COPD are: relieve symptoms, preserve lung function and prevent hospitalizations. Patients are asked to notify the office if they are having problems or if they run out of medicine, but often these requests go unheeded or occur at times when the information cannot be conveyed to a health care provider. Most patients are seen in the office at some reasonable interval e.g. every 6 months but what if some simple problems arise between visits and resolving them could save the patient an ER visit or hospitalization if it was acted upon early? Consider the patients that are hospitalized between office visits. When they return to the office they may even forget to mention the hospitalization. Medications may have been changed, but they cannot recall what was done or why. Medicare recognizes the need to have more aggressive and timely chronic care management. It believes that a program devoted to greater in-home supervision of patients with chronic diseases between office visits will improve the care of these patients and save money spent on ER visits and hospitalizations. To this end, Medicare has set up a Chronic Care Management Program and allocated 17 billion dollars for its implementation. No program can take care of all the problems associated with the care of chronic disease patients but this is a worthwhile start. 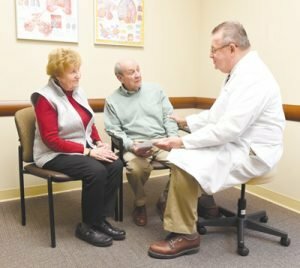 The Lung Disease Center of Central Pennsylvania and the Altoona Lung Specialists clearly recognize the potential benefit of a Chronic Care Management Program for the many patients suffering from COPD and other debilitating lung diseases. This recognition has prompted action. The Lung Disease Center of Central Pennsylvania and the Altoona Lung Specialists have developed a partnership with SPAC International, a company certified to provide services for this Medicare initiated program. 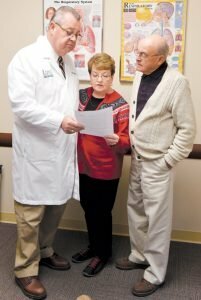 Starting in January of 2017 patients of the Altoona Lung Specialists who are covered by Medicare will be encouraged to enroll in the Chronic Care Management Program. Patients in the program will be called monthly between visits by a certified health care worker and asked about their condition and problems. Medications will be reviewed and any ER visits, or hospitalizations will be noted. These phone visits and any problems they detect will be conveyed to the patient’s lung physician at the Lung Center and if the problem is more appropriate for the family doctor he/she will be notified. This service will take place utilizing the electronic health record at the Dr. Zlupko elaborates on the information of chronic care management to patients.Lung Center and notes from the phone visits will be made part of the patient’s chart record. Patients will have a 24/7 phone number to a health care professional to access for non-emergent problems. The need for an early visit to the physician will be conveyed directly to the Lung Center. This will allow the lung physician to better monitor and provide the best possible care. Details and enrollment forms will be given to Medicare eligible patients at the time of their office visit. This new and innovative service for pulmonary care will only be available to Medicare patients. The Lung Disease Center and the Altoona Lung Specialists have chosen SPAC International as their partner in this effort because of their current track record in providing population health management services, medication reconciliation, and chronic care management services to over 500 providers in the United States and covering thousands of patient lives. SPAC International also works with national pharmaceutical firms and hospitals. We will monitor these services to be sure they provide the desired outcome, which is less ER visits, less hospitalizations, and better patient outcomes. The Chronic Care Management Program at the Lung Disease Center of Central Pennsylvania is another way the Altoona Lung Specialists are demonstrating their commitment to our patients and community. Offering this new and innovative program will help extend our pulmonary services beyond the office walls and help bring 21st century care to our Medicare patients with chronic lung disease. The paradigm for Lung Cancer has changed dramatically with the results of a large study of over 50,000 patients, which showed that patients aged 55 to 75 who have smoked for 30 pack years or more, and have an annual screening study using a low dose CT scan of the chest provides early diagnosis and could reduce mortality by 20%. A pack year is the number of cigarette packs smoked each day multiplied by the number of years a person has smoked. The physicians and staff of the Lung Disease Center are dedicated to the improvement of survival statistics in Lung Cancer patients. We know early detection is very important in the overall outcome of this disease, and are taking steps to provide the tools necessary to our community by offering this program. About 80% of Lung Cancer deaths are thought to result from smoking. The longer you smoke and the more packs a day you smoke, the greater your risk. Second hand smoke is thought to cause more than 7,000 deaths from Lung Cancer each year. And now third hand smoke, residue of cigarette smoke left in furniture, fabrics, walls and floors, is thought to carry significant dangers for adults and children. Over 300 Altoona Lung Specialists’ patients have enrolled in the Lung Cancer Early Detection Program and we continue to enroll patients at high risk. If you are at risk of Lung Cancer, get involved in the Lung Disease Center of Central PA’s Lung Cancer Early Detection Program today. In order to participate in this Early Detection Program, you must meet certain criteria which make you a high- risk for developing Lung Cancer. If you are 55 years or older, and have a total smoking pack-year history of 30 years or more, we would like you to consider this program. Please call our office to schedule an appointment to determine your smoking history and answer any questions about the program. If you meet the criteria to be in the Early Detection Program, you will be scheduled for an appointment with one of the Lung Disease Center’s physicians to review your health history and have your first CT scan. If your scan is negative (no concerns) then you will return to the clinic every six months for a chest x-ray and/or a CT scan so that each is being performed once per year. Why is Early Detection of Lung Cancer So Important? Lung Cancer is the leading cancer killer in both men and women in the U.S.
An estimated 158,040 Americans died from lung cancer in 2015, accounting for 27% of all cancer deaths, more than breast cancer, colon cancer and prostate cancer combined. Most patients discover their disease too late for treatment and 85% of patients will die within 5 years from Lung Cancer. If detected in its earliest stage, 1A, the 5 year survival rate is between 85% and 100%. 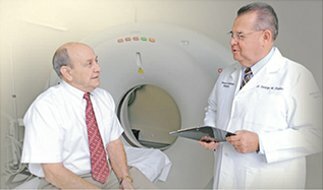 Why Should I Have CT Scan? CT scanning is a procedure which takes detailed cross-sectional x-ray images of the lungs. It is better at detecting small tumors than a standard x-ray, and gives a better view of the lungs using computers and two and three-dimensional images of the chest. It is better at finding small nodules in the lungs that standard x-rays often miss. There is a radiation exposure similar to that of a mammogram during the CT exam. Screening with a CT scan of the chest is easy and painless. Current research indicates that yearly CT screening improves the chances of early cancer detection with a significant increase in survival. Lung Cancer does not have symptoms in its early stages. All studies show that the earlier the lung cancer is detected, the better chance of the cure and survival, due to early treatment. To learn more about the Lung Cancer Early Detection Program call the Lung Disease Center of Central Pennsylvania, 814-946-2845. Don’t wait until it is too late to make a difference.